Gopher tortoises have won the day. Or at least they’ve won this Sunday. 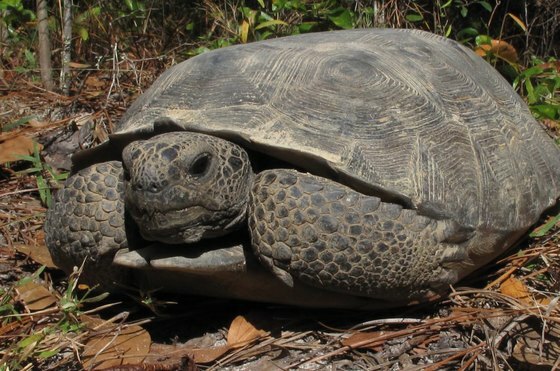 The Gopher Tortoise Council has proclaimed April 10 Gopher Tortoise Day. The regional council and its partners are raising awareness of these earth-moving reptiles, whose burrows provide shelter for hundreds of other species in the Coastal Plain and across the tortoises’ range. Learn more about gopher tortoises here, through this WFSU video and in the annual report of Georgia DNR's Nongame Conservation Section. Then take the next step: Help Georgia’s state reptile win this day and others by supporting conservation of tortoises and their habitats, shared by many rare species. One simple way is through the Georgia Nongame Wildlife Conservation Fund state income tax checkoff. If you haven’t filed, contribute through the checkoff. Giving is easy and every contribution helps. Already filed? Here are more ideas on how you can conserve Georgia wildlife. In his recent DNR blog post, Dr. Russ Andrews of Alaska SeaLife Center and University of Alaska Fairbanks takes readers through the second winter of work to track endangered North Atlantic right whales using LIMPET satellite tags. The project by DNR, Florida Fish and Wildlife Conservation Commission, Sea to Shore Alliance and NOAA Fisheries is aimed at developing a minimally invasive tag to monitor right whales as they migrate from calving grounds in the Southeast into the Mid-Atlantic, insight that could help conserve the species (“Tag! 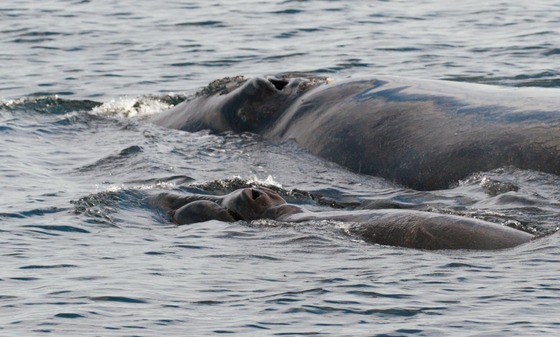 Right whales were it,” March 31, 2015). The focus this winter was on tagging juvenile whales or adult males. The only problem: No juveniles or known male right whales were seen in the Southeast this winter, writes Andrews, the project’s principal investigator. Check out Russ Andrews’ account of the tagging project this winter. The final calf count didn’t change from the previous Georgia Wild update: 14 calves (one died shortly after) were documented in the Southeast Dec. 1- March 31. Although counts have numbered in the single digits before – including seven in 2012 – the annual average over the past 10 years is 19.5 calves. Clay George, DNR’s lead biologist working with right whales, writes that in 2011, the most recent year for which statistics are available, the population was growing by 2.8 percent a year and the minimum number of North Atlantic right whales was estimated at 475. There are many reasons we’re so fond of the eastern redbud. Yet I suspect most of our affection for this small, native tree is based on its beauty, and not what I consider to be one of its most endearing features. Before the official arrival of spring, redbuds set our backyards and woodlands ablaze with their bright pink to purple blooms. In summer, the tree's canopy of heart-shaped leaves offers refuge from the heat. And in fall, the greenish-yellow leaves and purple seed pods – food for wildlife – help color the landscape. 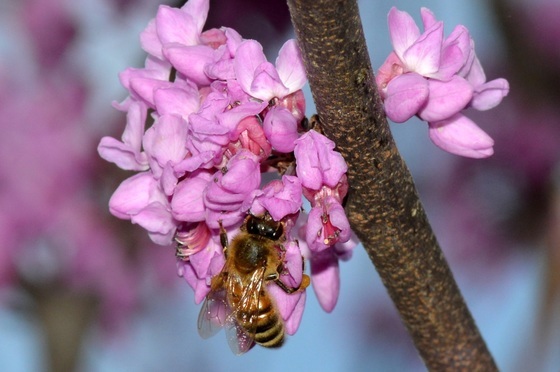 Explore the redbud's vital role with pollinators in the rest of Terry’s column. Peregrine falcons at Atlanta’s SunTrust Plaza Tower won't be nesting on camera this spring. For years, peregrines have raised their young in planters on balconies 50-plus stories high and live-streamed by DNR at www.georgiawildlife.com and on Ustream. This year, however, the birds either didn’t nest or chose a site that hasn't been discovered, according to cam partner Dentons, an international law firm with offices overlooking the balconies. A check of SunTrust ledges and roof lines last week turned up no nest. As a fellow falcons fan, DNR feels your pain. One way to help ease it is through the agency's wildlife cams page, where – thanks to conservation partners – you can follow Berry College’s bald eagles, great-horned owls at The Landings and underwater life at the Go Fish Education Center. 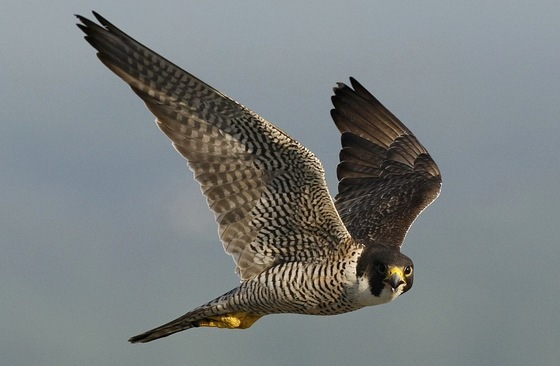 Next spring, DNR, Dentons and supporters such as The Environmental Resources Network hope to again live-stream Atlanta’s high-flying falcons. Missing Georgia Wild? Check your Clutter folder (if using Outlook) or non- Primary tabs (in Gmail). If you find Georgia Wild in either, click, drag and drop it in your inbox or Primary tab. That move should direct future issues there, as well. Imperiled minnows and suckers in the Southeast are mapped in this new Nongame Conservation Section web page. Compiled with help from agencies and experts across the region, the maps integrate more than 15,000 occurrence records to assess the conservation status of 36 species. White-nose syndrome has reached the West Coast. The Washington Department of Fish and Wildlife said last week it confirmed the disease that has decimated bat populations in the East in a little brown bat near Seattle, 1,300 miles from the previous western-most detection of the fungus that causes white-nose. Feds update cave guides. Coming soon to Georgia Wild: 2016 bat survey results in state. 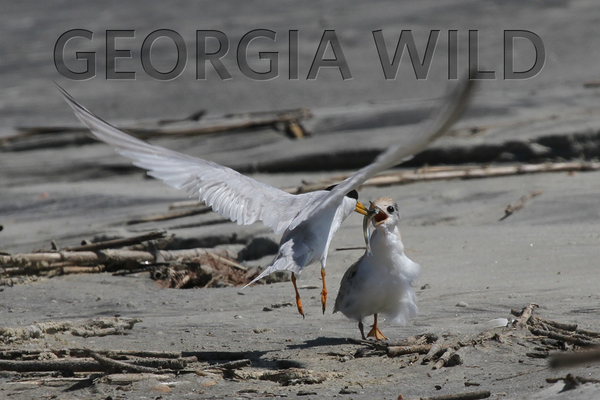 Give beach-nesting birds their space on Georgia beaches this spring or summer. 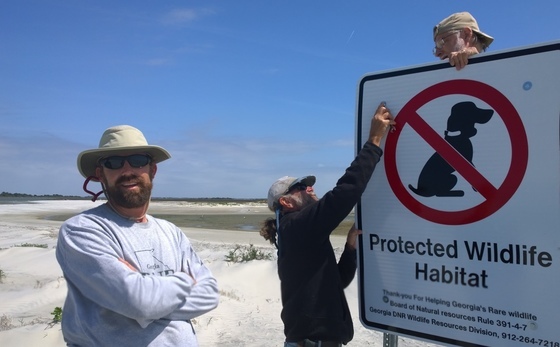 Human disturbance is a major threat for birds varying from American oystercatchers to least terns, species that already face risks from native predators, high spring tides and free-roaming pets. Beach behavior tips. Nongame Conservation staff recently played host to the annual Georgia Shorebird Alliance meeting, which drew 40 participants from government agencies and private organizations working to conserve seabirds and shorebirds. For box-nesting birds, Cornell Lab of Ornithology’s NestWatch website offers house plans, a guide to species in your area and even tips on installing nest cams. Middle-school students with a strong interest in wildlife should check out the Adventures in Conservation Education camp July 18-22 at Charlie Elliott Wildlife Center. The 20 youth admitted will be picked based on their essays answering questions such as why wildlife conservation is important. For only $100 -- which covers meals, lodging and trips -- campers will spend five days immersed in Georgia wildlife and wild places. Details. Reauthorizing the land tax credit and a resolution supporting creation of a 155-mile coastal bike trail are two legislative highlights in the Georgia Conservancy’s review of the 2016 General Assembly. Read the group’s gold dome pros and cons. Say’s spiketail dragonfly is widespread and populations are stable in south Georgia, according to a status survey. The species, known only from seepage areas at the base of longleaf pine sandhill ecosystems in the Coastal Plain, is state-listed as threatened, a listing the survey supports. Beyond Becoming an Outdoors Woman returns to Sapelo Island July 22-25. Based at Reynolds Mansion and ranging across Sapelo, the workshop series features safe, supportive sessions to help women learn and enjoy outdoor activities. 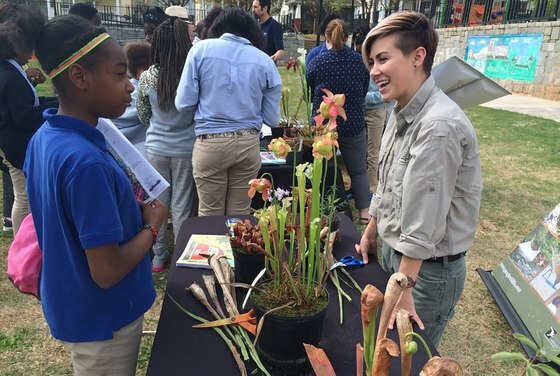 Names in the news: DNR botany interns Jordan Wallace and Rebecca Byrd helped inform fifth- through eighth-grade students about conserving pitcherplants and bog habitats during the Atlanta Science Festival Environmental Education Day, March 24 in Vine City Park. On April 1, Nongame education coordinator Linda May used a donated T-rex costume for this fun video with a serious conservation message. Dr. Bob Herrington, a well-known herpetologist who taught at Georgia Southwestern State University for some 30 years, died at age 68 in his Americus home on Wednesday. Senior wildlife biologists John Jensen published a paper on DNR’s Alabama map turtle survey of the Coosa River in Georgia Journal of Science. April 8 – Deadline for DNR Give Wildlife a Chance Poster Contest. Winners' artwork displayed May 11-17 at State Botanical Garden of Georgia, Athens. April 16 – Bird banding, 6 a.m. at Panola Mountain State Park, Stockbridge. Georgia Important Bird Areas program coordinator Charlie Muise. – Surveying eastern diamondbacks, other rare species. – Restoring forests with fire at Tallulah Gorge. "Rattlesnakes still thrive on barrier islands," Savannah Morning News (paywall). Also: Florida Times Union. "Does beach replenishment smother a shorebird's next meal," Conservation Magazine (University of Washington). Citing study in Estuarine, Coastal and Shelf Science. "Keeper of the island," The Atlanta Journal-Constitution. Follow-up: "Sandy West to stay on Ossabaw … for now." 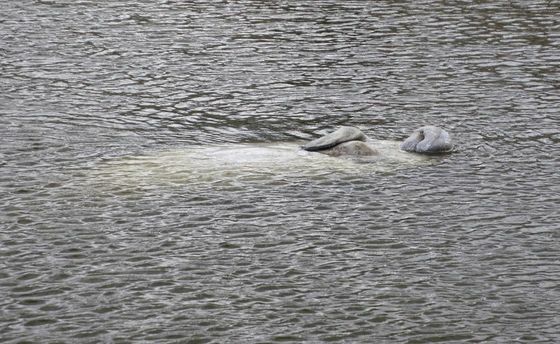 This manatee recently seen resting near a Brunswick marina is one of the first two manatees spotted in Georgia this spring by DNR Nongame Conservation Section staff. The big, rare mammals migrate from Florida to Georgia each spring, feeding on marsh grass and other aquatic vegetation in tidal waters until as late as October. Coastal boaters are urged to watch for manatees and sea turtles: Collisions with boats are a leading cause of death for these animals.